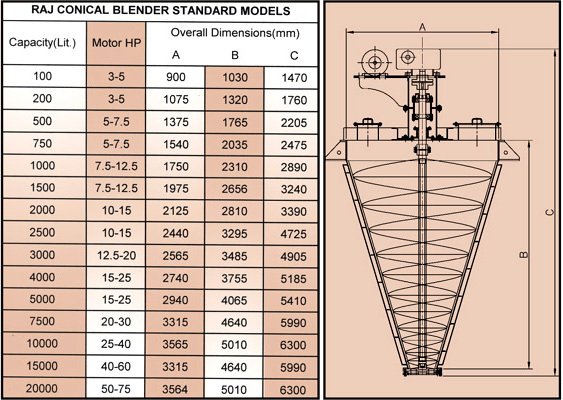 Conical blender consists of a conical vessel with a double start helix ribbon mounted on central shaft. This type of blender is used for mixing, granulation and homogenizing applications. It handles a range of applications from all types of powders including free flowing to cohesive and moist powders, bulk dry materials to wet cakes and slurries. Mixing time depends on the ribbon speed. The rotating central agitator shaft does not have bottom bearing support thereby eliminating any dead spots or difficult areas to clean and there is no possibility of product contamination. Discharge of the product is fast and simple as the bottom is fully open. a) Models with single or double helix. b) Capacities from 20 to 25000 litres. c) Cutting rotors for breaking of agglomerates. e) Heating / Cooling jacket or limpet with insulation. Raj Conical Blenders are best suited for mixing, granulation & homogenising batch process. It handles a range of applications from all types of powders including free flowing to cohesive & moist powders, bulk dry materials to wet cakes & slurries. Raj Conical Blenders are very sturdy and robust. They consists of a conical vessel with dished /flat head. The central agitator shaft is driven from top end with gear reducer. A double helical ribbon agitator in the vessel moves the product upward along the outer wall and releases it downward into cavities developed in the middle, simultaneously material is horizontally distributed by the mixing arm and is optimally homogenised. Mixing time depends on the agitator speed. In general mixing time is three to four times shorter than the mixers working with a rotating screw. The drive and bearings are kept outside of the vessel, no gears or seals in the product compartment. The rotating central agitator shaft does not have bottom bearing support there by eliminating any dead spots or difficult areas to clean and there is no danger of product contamination. Discharge of the product is fast and simple as full bore open. Models with single or double helix. Net capacities for 20 to 25000 litres. Various Material and surface treatment available depending upon product characteristics. Cutting rotors for breaking down ofagglomerates. Liquid addition by ISP system. Heating Cooling jackets with insulation. No danger of product contamination by lubricants.